This topic describes how to work with unmanaged pointers. As you know, Visual C++ also supports managed pointers. General information about the pointers, types of pointers are detailed in the topic here. 1. Which operators can be used with unmanaged pointers? 2. 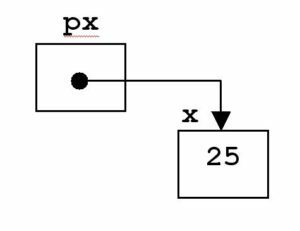 What is an indirect access operation with a pointer? 3. How does the C++ compiler determine the amount of information that the pointer points to? 6. What kind of relation operations (comparisons) can be performed with pointers? 7. What are the features of using a pointer to a void type? 10. What restrictions are imposed on the operation of taking the address &? 11. Is it possible set the pointer to a physical memory address directly? & – returns the memory address of the operand located on the right. This is a unary operator. Operators * and & complement each other. 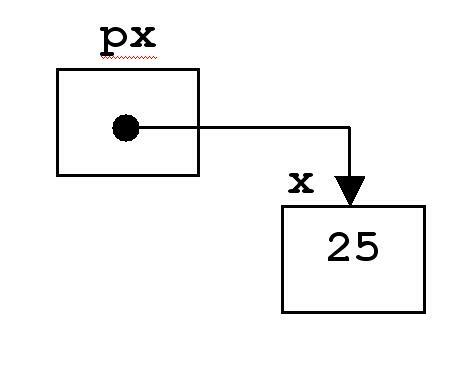 The value of px is the address of the variable x in the RAM. The indirect access operation is access to a variable (object) using a pointer. Using the pointer, you can access arrays of variables (objects). The word “indirect” means that you can access the value of a variable using another variable. The amount of information processed is determined by the base type of the pointer. The basic type of the pointer is double. One variable of type double occupies 8 bytes in the computer’s memory. Therefore, the C++ compiler will process 8 bytes of information when accessed by the pointer. The value of one pointer can be assigned to another, provided that they have the same base type (they are pointers to the same data type). If pointers point to different types of data, then the type cast operation operates. In this case, working with the pointer is unpredictable and can lead to invisible logical errors (or maybe not). //pi3 = pi1; // error! - "cannot convert from int to double"
addition + and subtraction – operations. Pointers can be used in expressions. sizeof(type) – an operation that determines the size of the data type. Example 1. Changing the pointer value. In the above example, the physical address of pointer pi2 is more by 4 bytes from the physical address of pointer pi1. This is due to the fact that int (the basic type of pointers pi1 and pi2) is 4 bytes in size (Win32 environment). Example 2. Changing the value of a pointer to type double. Pointers can be compared. For comparing pointers, the operations ==,>, < are used. When comparing pointers, it is important that these pointers have some connection with each other. For example, if pointers point to different unrelated variables, then the comparison operation does not make sense. In the event that pointers point to variables between which there is some relationship, the result of the comparison makes sense. This can be the case where pointers point to elements of the same array. Example. Let the array of real numbers A and 2 of the pointer be given. float *pa1, *pa2; // two pointers to "float"
C++ allows you to use a pointer to void type. The pointer to type void has its own peculiarities. This means that a pointer to type void is a universal pointer that can be set to any type of value, including zero. The keyword void gives information for the compiler that there is no data about the size of the object in memory. To set the void pointer to a pointer of another type, you need to use the cast operation. Example. Using a pointer to type void to access variables of different types. There are cases when a pointer needs to be set to zero. This is necessary to set the value of the pointer to something that does not match any of the pointers that are used in the program. In the <stdio.h> module, a NULL constant with a zero value is defined. It can be used to assign a null value to a pointer. Example. Assigning a zero value to a pointer. 9. An example of allocating the memory by the function malloc(), which returns a pointer to the type void. The malloc() function allocates memory for an unmanaged pointer. Function returns a void* type. To assign to the pointer a value of the memory address allocated to the object , you must perform an explicit type cast. Example. Using the malloc() function. This means that an attempt was made to access the protected memory. This applies to both console applications and applications created using the Windows Forms Application template. Example. Assignment of the physical address to the pointer. // Assignment of the physical address to the pointer.